South Carolina's favorite band is who? Lamere used data from Spotify and other data services to compile his list of bands by region, "He compared differences across regional and state preferences to figure out which artists were uniquely popular in different locations." For this study, [Lamere] sampled the listening preferences of about a quarter million listeners that have a zip code associated with their account. I aggregated these listeners into regions (state, regional and all-US). To compare regions I look at the top-N most popular artists in each region and look for artists that have a substantial change in rank between the two regions. These artists are the artists that define the taste for the region. 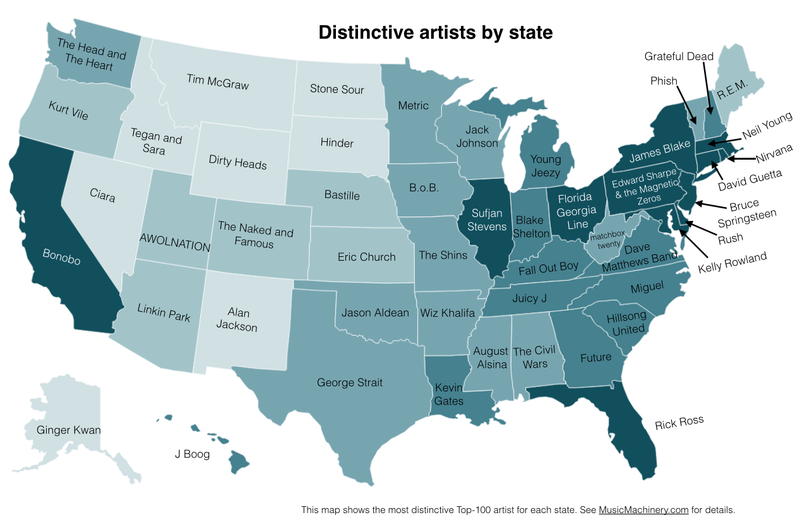 A map showing which artist enjoys the most outsized support in each state. To be clear, these aren't necessarily the most-listened-to bands in each state, but rather the bands that have unusually high support in each state. Lamere built a web app that makes it easy to explore the regional differences in music. With the app you can select two regions and it will show you which artists are distinctive for each region. Check out the app here and see an embiggened version of the above map here. "The Hillsong United band is a worship band that originated as a part of Hillsong Church. The band tours the world, performing at the various Hillsong church locations as well as general concert venues. They compose the songs for their own performances and for the other Hillsong Church worship teams that perform at weekly services. Subsidiary bands perform monthly in London and at summer camps sponsored by Hillsong. Their song "Oceans (Where Feet May Fail)" hit number one on the American Billboard Christian Songs chart at the end of 2013..."
I've never heard of them, and I'm not THAT far out of the loop. What about Hootie and the Blowfish? At least most Americans have heard of THEM. There has to be a shag band from SC--isn't that the state dance? Yeah. No idea who they are. Yeah. No idea who they are. But if you look at the map a good percentage are bands that I'm sure not many people know. The study is a little misleading in that it's basically bands who have disproportionate amount if fans in one state. So really it's band X has the most amount of fans in X state.